Paris not only shines for being "The City of Light", but for being the city of music, sound, dance, and revelry. Even the most skeptic would be charmed by Paris after sunset. 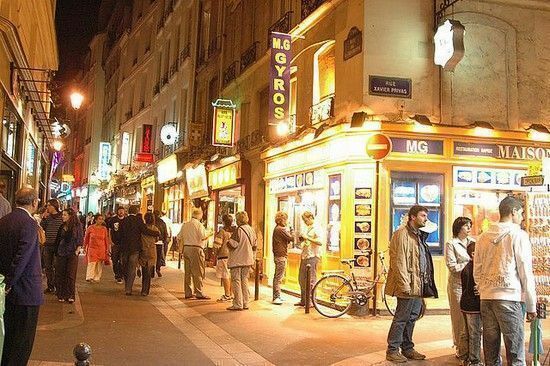 Though less frantic than other world capitals such as Berlin, Madrid or New York, Paris nightlife is legendary too. There you'll find relaxed bar-cafes, the most fashionable dance clubs, and mellow jazz clubs Maybe you prefer to go to some of its worldwide famous Cabaret venues or to any of the pubs spread throughout the city. And for all the gay people, there is the pink Paris, mostly in the Marais neighbourhood. Along the Rue Oberkampf there are the trendiest clubs for young people. It asserted itself as the city's coolest new hang-out in the mid-90s and even today it still is. The Bastille area is a must for those people who want to have a night long party. If money is not a problem, the Champs-Elysées is full of luxury bars and clubs and attracts lots of tourists that want to spend a great time. On a Paris night, the cheapest entertainment, especially for the young, is "the show" at the top of Ile de la Cité, behind Notre-Dame. The Buddha Bar is a symbol in the Parisian nightlife. It is known as an Asian trend bar, with the best music and decoration in the city. On the other hand, La Flèche d'Or combines live music with the perfect alternative ambience. If you just like to dance, the Queen club (considered one of the best clubs in Paris) would be the most indicated choice, nominally a gay venue but one of the city's best and most packed places to enjoy, no matter what your sexual orientation may be. Paris versatility is nowhere more visible than on a night out. If you begin the night having a cocktail at Place Vendome, and you finish it up with a beer in Belleville, you'll feel like you have been into different countries. Paris nightlife offers whatever you wish. The lines between cafes and bars in Paris are very thin. In most of them you won't notice the different of a cocktail bar or maybe an elegant café! There are lots of Irish and British pubs, specially designed for tourists. But that doesn't prevent fashionable Parisians from bar hopping. There are many bars oriented just for young people too. For all these older people, there are luxury locals such as the Ritz bar. In general, bars and pubs are open daily from 11am to 1:30am. If you are a club lover, you'll find in Paris all kinds of places with the best house, techno, Latin, hip-hop, garage or French popular music. Worldwide famous DJs play the best music in the Paris clubs. Le Divan du Monde, with Brazilian, tango, indie, rock, house and hip hop music; Le Saint, with house and salsa music; and les Bains Douches, a Turkish bathhouse transformed into an amazing place, are three of the most fashionable clubs in the city and an absolute must for the Paris nightlife scene! For gay people Paris is a world reference too. Gay life is centred on Les Halles and Le Marais Quarters, with a vast concentration of gay and lesbian shops, restaurants, bars and nightclubs. Take a look at the Guide Gai to know the latest trendy gay joints to go to.